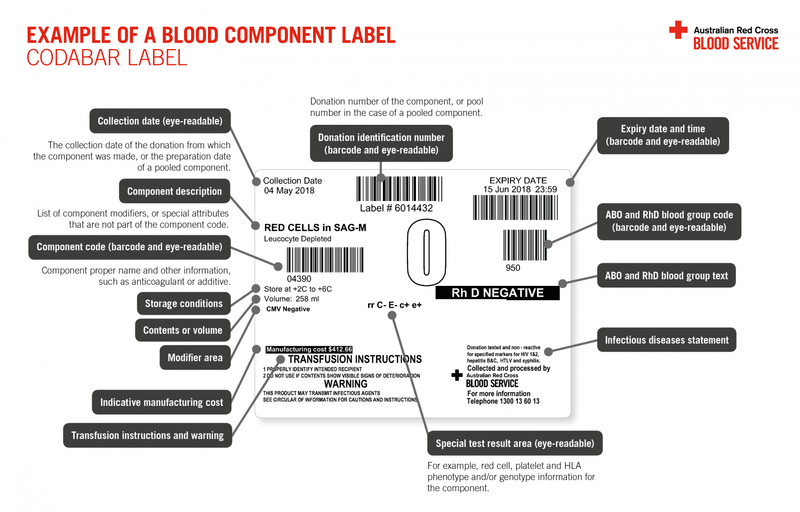 Blood component labels contain clinically important information about a specific component. The label format (shown in the image below) is the Codabar linear format which until now has been the type of labelling used by the Blood Service. However, from 18 November 2018 the Blood Service will be moving to the ISBT 128 labelling standard. Click here for more information about the ISBT 128 Transition Label. Labels can have modifier texts which specifies modifiers of the blood component, such as red cell phenotype or CMV antibody status. You should be familiar with their meanings. Always transfuse components only when labels confirm desired characteristics of blood issued for transfusion: for example, components that have been processed (eg, irradiated) or are either positive or negative for particular antigens [eg, RhD, Rh(E) or K]. For information on Codabar component codes as well as more examples of Codabar labels on specific blood components, a document on Label and Component Information details specific barcode information, label code descriptions and packing slips.